I read an awful lot as a kid, but there are still plenty of books that I missed. I’m starting to wonder if I had some sort of strange prejudice against girls named Betsy–after all, I didn’t discover Betsy Ray until college. And only recently did I discover another delightful Betsy. Understood Betsy by Dorothy Canfield Fisher (published in 1917) became a choice for the museum’s book club when I discovered that Fisher was a devotee of Maria Montessori’s ideas and had written the book to promote those ideas. Our theme this year is “education” so it seemed like a good way to talk about the student experience during the early 20th century. Montessori’s ideas were relatively new (and somewhat unpopular) in the United States in 1917. I’ll admit–when I started reading, I expected it to be more than a wee bit preachy. Instead, I found a thoroughly delightful addition to the “plucky orphan who finds a better home” genre. If a reader didn’t know about the Montessori connection, they certainly wouldn’t guess that this is a book with an agenda. Unlike many similar books, Betsy has a pretty good home at the opening of the book. She is completely coddled by her Aunt Frances, a woman who might have been the very first helicopter parent. When Aunt Frances’ mother becomes ill, Betsy is sent to the dreadful Putney cousins–a family that makes everyone do chores! Think for themselves! Learn by doing! In a completely predictable turn of events, Betsy develops into a strong, confident young lady and ultimately continues to live with the Putney family. During our book club discussion, we wondered some why this book wasn’t better known. Though there seem to be plenty of folks incredibly nostalgic for this book, Betsy usually isn’t mentioned in the same breath as Anne Shirley, Sara Crewe, Mary Lennox, Rebecca of Sunnybrook Farm or even Pollyanna. We came up with a couple of theories as to why. One is that the most famous orphans weren’t created by American authors. Another person suggested that it was because there is only one book about this Betsy. But I wonder if part of it doesn’t have to do with the author herself. 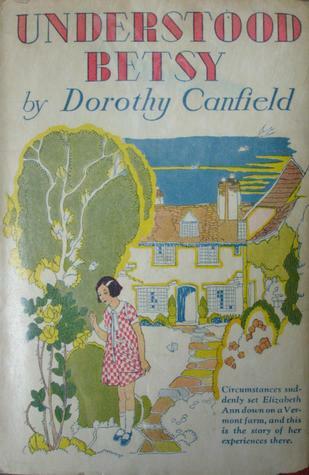 Dorothy Canfield Fisher wrote many, many books–some for children, some for adults. She was much, much more than a writer–an activist, reformer, and all around fascinating lady. I’m dumbfounded that there hasn’t been a full length biography of her since the one published just after her death in 1958. In one of my favorite tidbits, she served on the Book of the Month selection committee for over 25 years. Did her wide-ranging involvement mean that this charming part of her career was left in the dust? Was it not significant enough? And yet, the book has basically stayed in print all these years. Nevertheless, out of our book club, there was only one person who had read it as a child. And the only reason I knew about it was through my Betsy-Tacy friends. But we all agreed that we would certainly hand Understood Betsy to a child who liked historical fiction. It is perplexing how this book has both lasted, and yet been undercover. Regardless, it’s always exciting to add another character to the orphan club in kidlit history. There are an awful lot of members! Quick, how many kidlit orphans can you name? Go ahead–I’ll be here after you finish your list. A lot, right? Anne Shirley (and just about all of Montgomery’s heroines), Sara Crewe, Mary Lennox, Rebecca (of Sunnybrook Farm), Pollyanna, Judy from Daddy-Long-Legs and on and on. Then, throw in the kids that have a parent absent for all or most of the book–the March sisters, the Melendys, the Five Little Peppers and on and on. Suddenly, it seems like a household with two parents is rare indeed in this fictional world. I can certainly see the appeal for an author–no parents really opens up the dramatic possibilities for a character. I remember being completely enchanted with The Boxcar Children–setting up house in a boxcar? And it’s not like this is a plot device that has faded in recent years. Harry Potter might possibly be the most famous orphan ever. But for children living in the 19th century, losing a parent to death was a very real possibility. In 1900, the average life expectancy was 48 (lower if you weren’t white.). About half of all young people lost at least one parent before they reached 21. Leading causes of death included influenza, pneumonia, and tuberculosis. And for women, childbirth was up there as well. Anne Shirley’s story may have hit really close to home for her first readers, and yet she was immediately a best-seller. Many of these stories endure, even though today children are far more likely to lose a parent to divorce than death. In some ways, this doesn’t make sense–the idea of losing a parent is terrifying. Why would anyone want to read about such a thing for fun? Perhaps part of the appeal of these orphan stories is that most of these stories have happy endings. The kids find homes, whether with long-lost relatives or strangers. They have sparkling personalities that makes them lovable. They have adventures that readers with a secure home can barely imagine. I recently met another beloved orphan in Adopted Jane by Helen Fern Daringer. This is a book that I hadn’t heard of but came highly recommended. When I added it to my goodreads shelf, there were all sorts of people that said “Oh, I love this book!” Jane is an older orphan (you know the type–a good girl, but no longer young and no longer cute and less likely to be adopted). She has a remarkable summer where she gets to visit two different homes–her first experience in a “real” home. And then, both families offer to adopt her and she gets to choose a forever home. “Oh, and to say I love them.” In all her life Jane had never spoken out loud about loving anybody, but now the word sounded right and natural. “Oh, no, ma’am,” Jane agreed eagerly. “I want to save it for–” She checked herself just in time. She had almost said for college. Matron would not approve of college; she would call it “highfalutin folderol. At this point, the happy ending hasn’t come yet. Jane is still an orphan, though now she has dreams. With that perfect happy ending, the reader is assured that Jane will get everything her heart desires. I don’t anticipate orphan tales–or tales of absent parents–will ever go away. As kids grow, they want to stretch their boundaries. What would I do if I just had me? Could I make my way? But these stories are safe. By the time the book is closed, they are no longer alone in the world. And that is satisfying indeed.